Wow this is so great. I love the power behind it’s beauty. 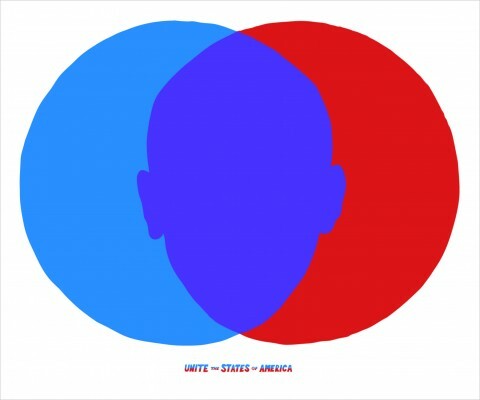 The whole red and blue thing, along with the impact of the circles for votes. I think this expresses a lot of thought with some simple shapes. The best part of all, is that the Obama head in the middle is shaped very much so like his head is in real life. Kind of made me chuckle. Nice, though the concept is lifted from a Jeep campaign done overseas in 2008… where exactly slips my mind. I still have some of these prints left. If you’re interested in buying one please email me. Chis: Not necessarily if the red was printed first, then a slightly translucent blue on top. It might just make it darker (which it looks like it did). Hey – doesn’t that look a lot like the MasterCard logo? The center IS purple, sillies!…just looks transparent next to the two colors, which is an effect you learn in color study. I agree that most Americans (who have never studied color theory) would see the center color as darker blue, and that this hurts the message of an otherwise lovely design. I’m sorry for the confusion. The image on this site is a digital representation of what the final print looks like. It is not a photo of the print. When it was actually printed, the inks were mixed with transparency. The red was printed first so depending on whether the red dried completely before printing the blue, the center color varies anywhere from navy blue to purple. This is really great. I like it because of its’ simplicity- along with being unpretentious it has a high emblematic regard. The simplicity of the picture gives an open opportunity for interpretation- for instance politics. In Denmark, the colours red and blue represent the oppositions of the political boundaries. For instance blue is representive for rightwing conservative values and red is respectively leftwing ideals. Taking that into regard it cooks your noodle raises questions like what kind of policies does Obama substatiate?? looks like a mastercard logo to me- which was what I immediately thought of, which I suppose works- we are a consumerist society after all. early, it is neither good for health, nor be harmful the stomach. is closer than you actually think.